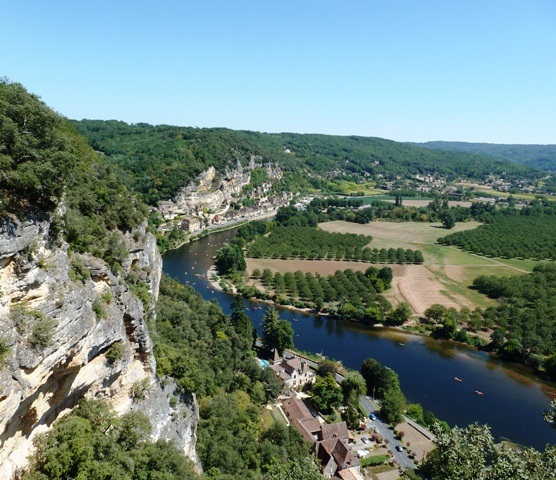 Nestled on the top of limestone cliffs, Les jardins suspendus de Marqueyssac, overlook the Dordogne Valley, here formal topiary gardens meet the stunning panoramic views of the Dordogne River and Valley. I’ve wanted to visit les jardins suspendus de Marqueyssac ever since I stumbled across a leaflet for them in a restaurant in Brive. Finally, in August, I managed to persuade Paul to take me there, and I wasn’t disappointed. Upon entering the gardens, you pass by the 18th century château, and are instantly greeted by the wonderous boxwood gardens I fell in love with on the front cover of that leaflet. 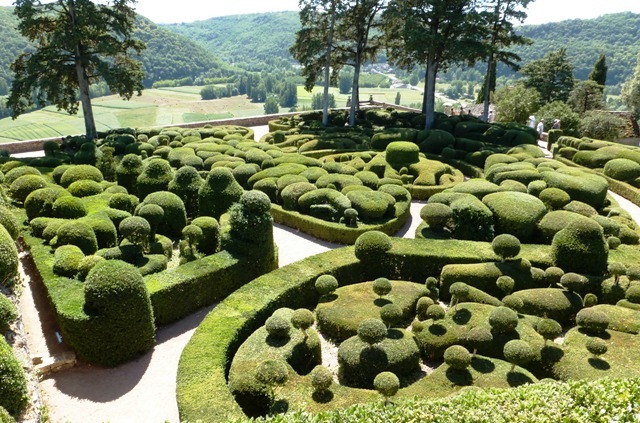 For it is box and topiary that form the main theme of the gardens of Marqueyssac; formal topiary terraces and 6 kilometres of box-lined woodland walks surround the entire estate. It is reported that tens of thousands of boxwoods were planted in the late 19th century to form the gardens, and that they need pruning twice a year, now that’s an awful lot of snipping! The intertwining, bulbous, flowing shapes of the box in the terrace gardens are truly amazing and I can not help but wonder how the design was conceived in the first place. For those of you who know me, I am a flower lover, my garden will always be packed with them, but having seen these gardens, it has got me wondering how topiary can be included in my garden to give it an air of order amidst the chaos of colour. 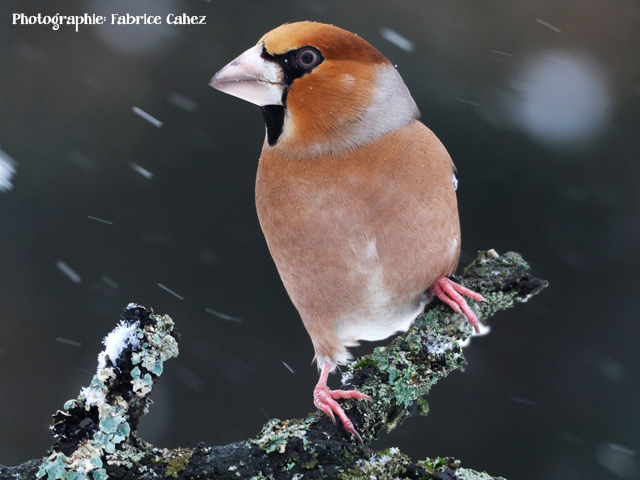 The gardens are open all year round (all year round and they’re in France?!) 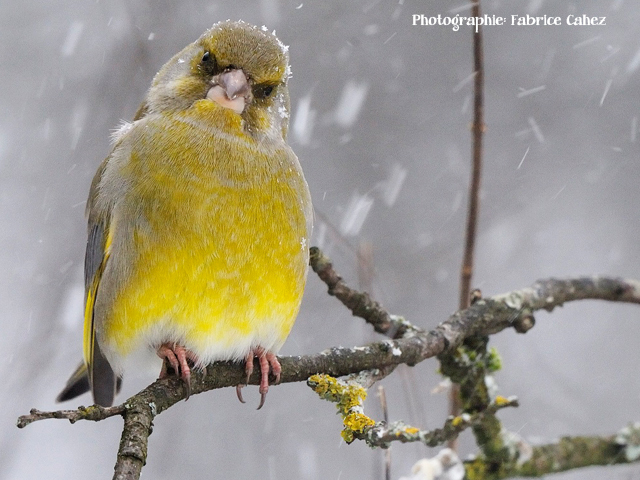 and I imagine they would look like a wonderland under a thin layer of snow. I think maybe I’ll have to start working on Paul to take me again, once the snow has fallen. 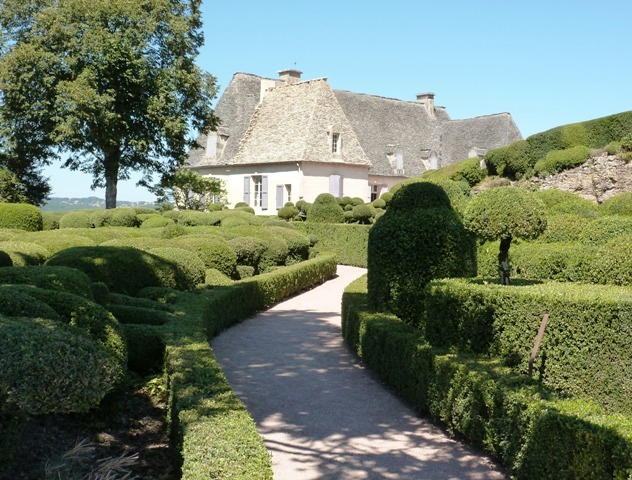 Topiary isn’t for everyone, order and formality isn’t for everyone, but les jardins suspendus de Marqueyssac certainly are inspiring, if not for the boxwood, then for the breathtaking views of the Dordogne Valley. For directions, opening times and prices, please click here. If you have already visited the gardens, I’d love to hear your views of them.